A cooking class at Charis House makes grilled vegetables. It’s no secret that eating more fruits and vegetables can make you healthier. However, a report from the U.S. Department of Health says 75 percent of Americans aren’t eating the recommended amount of produce. In some parts of Fort Wayne, there are areas called food deserts where it is especially hard to find fresh fruits and vegetables. That’s why two Allen County organizations are teaming up to offer healthy eating cooking classes for low-income residents. In this week’s NorthEATS Indiana, WBOI’s Lisa Ryan reports on the garden-to-table program. Last year HEAL, which stands for Healthy Eating, Active Living, launched its pilot program and taught healthy eating classes in three homeless shelters in Allen County. Laura Dwire is the program manager of HEAL, and she’s hoping to bring the program to 25 organizations this year. Dwire says they are calling the program HEALing kitchens. “It teaches the value of cooking healthy with fresh produce and the nutritional value of that, but it also teaches you how to incorporate healthy foods into, say, food bank staples and low-cost foods,” Dwire said. Dwire says last year, they were able to increase participants’ knowledge of nutrition by about 16 percentage points after testing them at the beginning and end of the course. They also asked how often the 51 participants consumed fruits and vegetables before and after the class. We always want to interject a big element of fun because... class has to be fun and real and meaningful. After the success of the program’s pilot year, HEAL wanted to offer the healthy eating courses at 25 sites, including churches, Boys and Girls clubs and other organizations. It costs about $500-$1,000 to teach the course, depending on the size of the class. This year, HEAL received more grant funding from St. Joseph Community Health Foundation and Parkview Health. The grant covers the costs for the additional sites, food, supplies and a stipend for staff. Kathy Wehrle is a registered dietician with Parkview, and she created the curriculum. The curriculum teaches participants how to cook with fresh produce, read nutrition labels and change their behaviors to be more active. Wehrle says chronic disease is more prevalent in food deserts, so they are hoping to offer courses in those areas. If an organization applied outside of a designated food desert, it would still be considered, as long as it served a primarily low-income population. Wehrle says at first many participants weren’t interested in the course, but over time they became involved and enjoyed it. Residents of the Redemption House prep a healthy meal. At the end, participants bring their kids and cook a family meal. “When it’s time to eat the food that’s been prepared, the houses really get into decorating and really making it into a festive environment where the women can really enjoy the fruits of their labor and have a great time and feel special,” Wehrle said. It was primarily women last year, but some men participated. Program leaders are hoping to have more diversity in this year’s group. The curriculum covers eight sessions, which can be divided up into eight or 16 weeks. Customers shop for produce at the McCormick Place farmers' market. HEAL also has three farmer’s markets throughout Fort Wayne, which take WIC and SNAP vouchers. Dwire says transportation and cost are some of the biggest inhibitors to eating healthy. “So we’re trying to break down the transportation barriers and the financial barriers,” Dwire said. 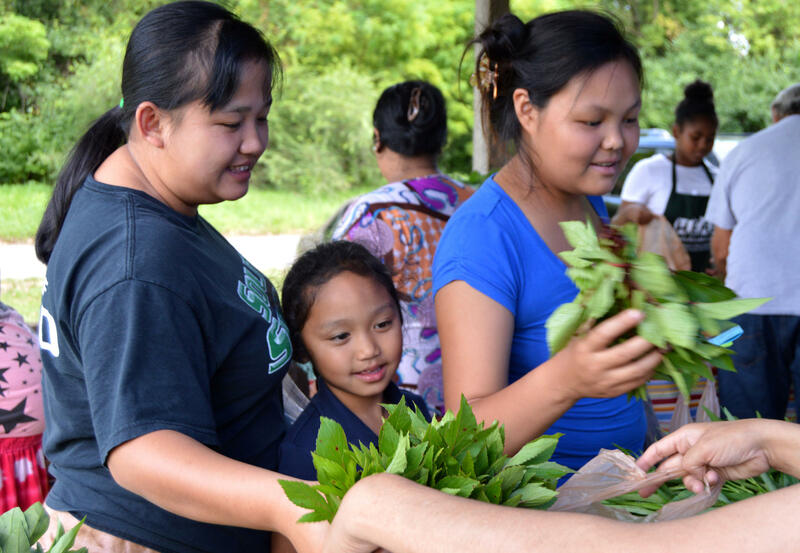 HEAL hopes to get rid of some of those barriers and provide fresh produce and nutrition education. Dwire says in the coming years, she hopes the program will continue to grow. “Our goals for this year are greater impact,” she said. Grant applications to host a HEALing kitchen are due by May 11, and the courses would take place in the summer. Find out more on HEAL's Facebook page. There are parts of Fort Wayne where residents don’t have access to fresh, affordable food. These areas are known as food deserts and can be found around urban parts of the country.